A true Aboriginal leader and hero, this 24 page booklet tells William Barak's incredible story clearly and simply. It includes many photos and illustrations of his artwork and would be ideal for students. As a politically astute Kulin leader and an artist painting about Aboriginal subjects in a European style, Barak was one of the few Aboriginal people to have an impact on public consciousness in the nineteenth century. He led his people to a land they could call their own at Coranderrk near Healesville. 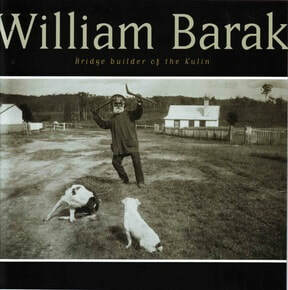 The booklet was commissioned by the Victorian Government on the building of the William Barak footbridge in 2006, connecting Birrarung Mar to the MCG stadium. The booklet can be purchased from the Koorie Heritage Trust's shop or you can order via Shop Online for $15.00. An autobiography by Ric Throssell, My Father's Son was runner-up in the National Book Council Banjo Awards for Australian Literature. Author Ric Throssell was the son of celebrated writer and communist Katharine Susannah Prichard and the Victoria Cross winner Hugo Throssell. It tells the story of diplomat Ric Throssell's long battle to break through the suspicion and prejudice that stifled his Foreign Affairs career as the result of being the son of a famous communist. In 1997, em PRESS published a revised edition, which includes a new final chapter that uncovers the information in top secret files held by ASIO on Throssell. A recent book still asserts Throssell was a Russian spy. Praise for My Father's Son in the Sunday Observer: "A moving, romantic and often exciting account of a life scarred with grief and controversy, and healed with joy, love and vindication." The final novel by Ric Throssell, Tomorrow begins with the flight of a young Polish Jew, Galina, from Nazi Europe to a new life in Australia. This epic novel is Throssell's take on utopian dreams and their dark side. It traces the war against Japan and the fear and repression of Communism in the 1950s. In its review, the Canberra Times described Tomorrow as an important novel: "Quite apart from the quality of writing and sense of place which is evoked with considerable clarity, Tomorrow offers an insight into not only the operation of communism in Australia, but the people who were attracted to it as an idea." You can buy My Father's Son and Tomorrow on the Shop Online. Click here for a Review. A guide for Victorian landowners, Sustainably Managing Private Native Forests was extensively revised by forester Mark Poynter and redesigned and edited via em PRESS Publishing in 2009. Commissioned by Aboriginal Affairs Victoria, in the year 2000, this booklet presents approaches and general guidelines for conserving Aboriginal cultural sites and places in coastal Victoria. Aboriginal cultural sites and places are found from one end of the Victorian coast to the other – more than 4,000 to date. And this number is increasing every year. Many of the sites are very fragile and exposed to a large number of threats. The very instability of the coastal environment and its high population density places coastal Aboriginal sites at significant risk.